Disney gives us license to be "goofy." Over the past two weeks, I have spoken with my daughter, Alexa, and my middle son, Kevin, about their favorite Walt Disney World memories. They've drawn lists, given on-camera interviews and happily relived magical moments. (just click on their names to see their memories) Then there is my tween son, Kyle... twelve years of mood and attitude. He's not interested in strolling down memory lane. 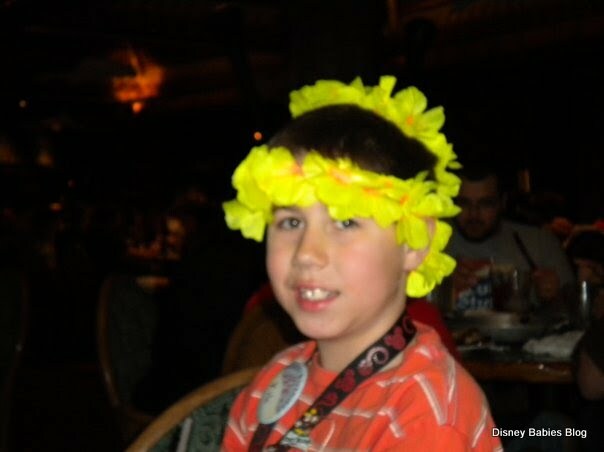 He doesn't want to recall when he was picked to be the Polynesian Resort's Prince-of-the-Day. He had positive words for just two attractions: Tower of Terror and Expedition Everest, and he also praised every buffet we went to - because most of them had fries or bacon. Now, as a mother, here is what I recall about my jaded tween's Disney experiences. As soon as we passed through the gates, the jaded, tough exterior facade dropped. He behaved like an 11 to 12-year-old kid. During breakfast at Chef Mickey's, he played with Pluto and danced with Goofy. He was thrilled when Space Mountain broke down, so he could get a better look at the inside of the ride, and the "Return Anytime" FastPass was pretty cool too. He did cannonballs into the pool each day. He ran to be the first in line for the boat that took us from the Polynesian to the Magic Kingdom - in fact we had the first boat of the day all to ourselves, another good reason to wake up early at Walt Disney World. Only part of the magic of Walt Disney World lies in the memories you make. The rest of the magic lies in how it transforms people the moment they enter the resort. As adults, we have license to become kids again. Our kids can let down their jaded, 21st century outer shells and become little kids again too. At Walt Disney World we are not weary of strangers and cultural differences are embraced. He may not want to recall all the magical memories right now, but when he is ready, I have all the memories kept safely waiting for him. so sweet! My 10 year old son is entering the "I'm too cool for WDW" phase now... this post made me smile! :) thanks.